Our “settlers” are live-in volunteers who care for the house and host events. Jonathan Balmer is serves as Public Relations settler, and loves using technology, social media, or simple conversation to tell the stories of people who use our community space. He is a third-year seminarian at Baylor’s Truett seminary, and a youth minister at Seventh and James Baptist Church here in Waco. Before coming to Truett, he was a teacher. He taught high school English in Kentucky, and middle school ESL in South Korea via the Fulbright program. He studied English and History at Georgetown College in Kentucky. It was there Jonathan met his fiancée, Kendall, who lives in the main Good Neighbor house—right across the yard from his current home at the Good Neighbor cottage! He is an avid podcast fan. He misses Cincinnati’s own Skyline Chili, but he’s grown to love all the local taco trucks in Waco. Vanessa Zuck is originally from Orange County, CA and recently moved to Waco after living in Denver, CO for one year, and St Andrews, Scotland before then. She just started her Masters degree in Social Work at Baylor, with a specific interest in clinical mental health. She is excited to be a new member of the Waco community. Vanessa loves going on adventures, baking, and astronomy. 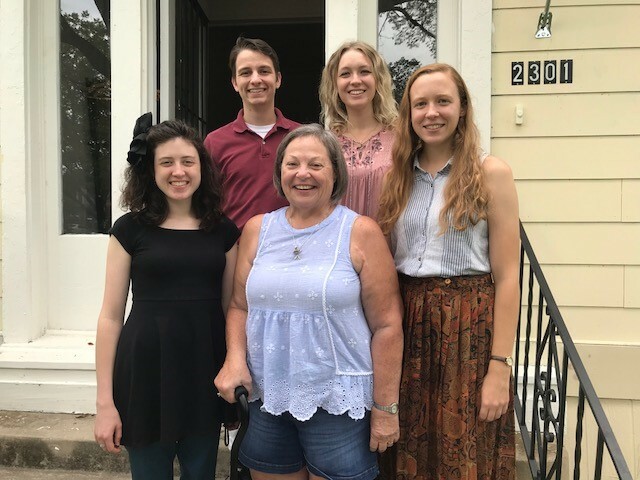 At the Good Neighbor House, she is the community engagement settler, which means she meets a lot of new people, makes connections with our neighbors, and ensures new neighbors and community members have opportunities to learn more about us. A Kentucky native, Kendall graduated from Georgetown College and moved to Waco in 2017. Since being in Waco, she spent a year as a classroom aide with Waco ISD, and is currently a dual-degree student at Baylor’s Truett Seminary and Garland School of Social Work. Her favorite ways to build community are through cooking or hiking with others. Passionate about languages, cultures, and community, one day Kendall hopes to work with refugee clients throughout the resettlement process. Marty Land moved to Waco in May 2017. Her son, Lucas Land, and his family have lived in Waco since 2005 but currently serve in Bolivia on a three-year missionary posting. Her daughter, Kira Land Connel, and her family live in San Angelo, Texas. Marty’s children and her seven grandchildren are her pride and joy and her biggest hobby. Her background is in nursing having completed her Masters in Nursing at UT Austin in 1995 and receiving her RN after 12 years of working in the nursing field as an LVN. She also received her Bachelor of Music Education in 1975 from Texas Lutheran College. Marty started as a settler in April 2018. She also volunteers and works with the children at Compassion Ministries here in Waco as well. She is a member of Columbus Avenue Baptist Church and plans to make Waco her permanent home. An avid reader, Marty loves handicrafts and being with family and friends. Joelle recently moved to Waco to start in the philosophy PhD program at Baylor. Before this, she worked as an Aldi cashier in Moberly, Missouri. Joelle loves communal living and gardening, so she is excited to be the “yard and garden settler” at GNH. She welcomes any suggestions (and help) on how to make the outdoor areas of GNH more sustainable and welcoming.